Immerse™ display system is a family of lightweight displays infused with exclusive features. Both straight and curved models feature aluminum pop-up frames to keep costs down. Units pack small, yet have a big presence so you can impress event attendees and immerse them in your brand! 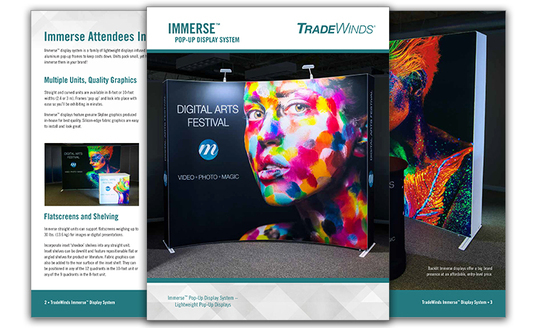 The TradeWinds Immerse™ display system is a family of lightweight displays infused with Skyline features and Skyline quality. Both straight and curved models feature aluminum pop-up frames to keep costs down. Units pack small, yet have a big presence so you can impress event attendees and immerse them in your brand! To request a free product brochure, complete the form today and we will send you a copy via email.